Option Robot Review - Binary Option Robot Scam? Option Robot Review – Binary Option Robot Scam? Since 2015, I’ve reviewed more than 200 online scams, and a vast majority of them are binary option robot scams. This is a largely unregulated industry and we have new binary option scams sprouting out every single day. If you must choose to make money by trading, I strongly recommend you to learn how to day trade manually. A good place to start is at babypips.com. Even so, trading is highly risky and it is difficult to generate consistent income online. A better alternative is to start an affiliate marketing business online. It’s free to get started, and you can grow it like a real business to expect consistent income. Over time it can even grow to 4 or 5 digit full time income that is self-sustainable. Affiliate marketing is what helps me make $1,000 to $2,000 per month consistently, and I hope it’ll be the answer that you’re looking for as well. No matter what you choose, don’t buy into the promises of binary option robots. It’s never a good idea to dabble with binary options at all. Have you seen banners or sales videos online promising to make you tons of money without lifting a finger? This is the common sales pitch for binary option robots. These robots are often hailed as the holy grail of trading, where they make sophisticated trades on your behalf and deposit profits into your account automatically. You don’t have to lift a finger. All you need to do is to open a trading account through their links and deposit a sum of money ($250 minimum in most cases). Once you activate the software, profits are supposed to roll in automatically, and you will be an idle millionaire in no time. Of course, none of the 100+ binary option robots that I’ve reviewed fulfilled their promises. Every single one of them lost money for their clients. I was also a victim to binary option robots, where I lost hundreds of dollars to auto-trading in several different occasions. Now, Option Robot definitely looks more legitimate than those sketchy systems that promise to make you millionaire overnight. It has a professional website, and there are even different trading styles to choose from. However, it doesn’t change the fact that it is still a binary option robot. The way it operates is the same as other binary option robots, it’s just the packaging and presentation are designed to look more trustworthy. Not only that, the fact that it offers Martingale trading style is a big red flag for you to stay away from it (more details below). For those of you who haven’t heard of binary options before – it is a risky trading instrument that is very similar to mindless gambling. Basically, you try to make money by guessing the market movement. Let’s say you have selected the gold market, and you try to predict if the market will move up or down 5 minutes from now. You buy a 5-minute contract. If you make the correct prediction, you win a certain percentage of your bet (e.g. 80% of your $50 bet). But if you are wrong, you lose the entire sum. It doesn’t matter if your prediction comes true at the 4th or 6th minute. Only the price at the time of expiry matter, and if your prediction is wrong at the time of expiry you have just lost the bet. Most contracts of binary options expire in a very short time frame, from seconds to minutes. 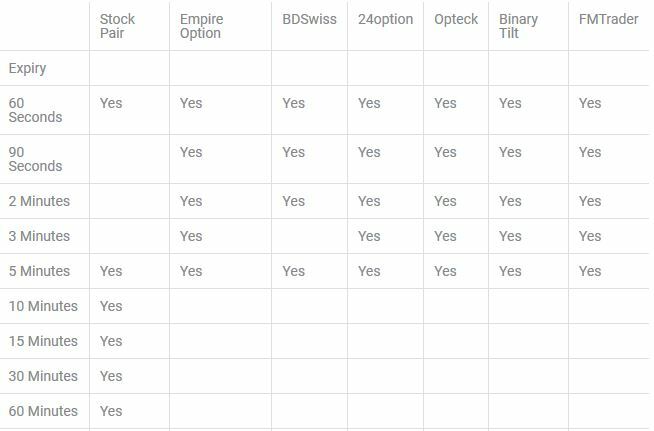 In the table below, we can see that almost all brokers affiliated with Option Robot offer up to only 5 minutes of expiry time. In such a short period of time, the market movement is essentially random, and your prediction is basically a shot in the dark. Because of the way it is structured, you will lose money even if you manage to get a 50% win rate. You are betting $50 for a chance to win $4o in a game of random coin toss. Out of 100+ binary option robots that I have reviewed over the past 2 years, all of them claim to have a very high winning rate of 80% or above. Option Robot claims to have a winning rate of 83%. However, none of them delivered the promised results. Every single one of them lost money, as evidenced from client feedback and the emails I’ve received from my readers over the years. Option Robot has come up with a clever to boost the confidence of potential clients. They provide a free demo account so you can see how the software operates in “real world condition”. Sounds cool, right? Nothing gives clients more confidence than a real taste of the software. Be careful though, because this is where they get you. John Novak from Thebestbinaryoptionbrokers.net did a test on Option Robot. 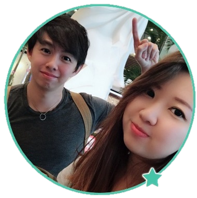 He opened a demo account, set it to trade only 1 pair (EUR/USD), and only 1 trade at a time. No other changes were made to the settings. In the video below, the left screen shows Option Robot in action, while the right screen shows the actual EUR/USD live feed. He used a yellow horizontal line to mark the price where the robot entered the trade and tracked the outcome. In the trade above, Option Robot closed the trade as a win, even though in reality it should have been a loss. Now, it’s important to note that John was using the FXCM live feed, while the demo account was using eToro pricing feed. Some may argue that since the price feeds were from 2 separate sources, the outcome could have been due to the differences in the feed. If I had not seen more than 100+ binary option robots fail, I could’ve adopted this point of view too. However, there have been many Option Robot users who reported making money with the demo account but lost money as soon as they switch to the real account. If you sign up for the free demo account, most of the time your trades will result in a victory. This gives you an adrenaline rush and at this point most people will deposit real money into their accounts. And this is where the nightmare begins. You will start having a losing streak with your real account and soon all your deposit are gone. You can’t claim a refund because you voluntarily deposited these money and lost it to Option Robot. It’s a trading loss, so you can only accept the loss and learn your lesson. Don’t learn it the hard way. The fact that it offers Martingale betting system means you will lose your money even quicker. Actually, the Martingale betting system has been around since the 18th century in France. This strategy has the gambler double his bet after every loss, so that the first win recovers all the previous losses and produce a marginal profit. The strategy will work well if the gambler has infinite wealth, but it’s obviously not the case for most of us. Mind you, the amount you have to bet increase exponentially and can make you bankrupt very fast. The losses with Martingale system add up exponentially! The increment in investment amount may seem insignificant at first. Since the idea of the Martingale betting system is to recover all the previous losses and produce a marginal profit, every subsequent bet has to cover all the previous accumulated losses. In the table above, I assumed that the winning payout for your broker is 77% (which is considered quite high). To put it simply, if you bet $12 and win when the contract expires, you get $9.24 profit. But what if you lose? According to the Martingale system, you need to bet $28 in the next round, so a win will produce $21.56 profit. This will cover the previous loss of $12 and make you $9.56 profit. Now follow the table along and see what happens if you have a losing streak. Keep in mind that it’s not uncommon to have more than 5 losing streaks in a row when it comes to binary options. If you lose 5 bets consecutively, you would’ve lost $610. In your 6th bet, you will need to risk $800 in the hope of producing $6 net profit after accounting for the previous losses. The required bet gets exponentially higher as you have a longer losing streak. The question is – for how long can you sustain the losing streak before it wipes out your capital? If you are having a bad luck streak and have to make the 10th bet, you are risking $22,500 in the hope of making a $15 net profit! How many people can stomach that? Well, even if you don’t choose Martingale system and go for Classic or Fibonacci trading styles (2 other styles that Option Robot offers) instead, no one has made money with the automated software. The clients are the only ones risking their money out there. Option Robot and their affiliated brokers get their share of profits and commissions for every trade that you make. By now, it should be clear to you that binary options is bad news, and it’s even worse if you let a piece of software lose money on your behalf. To date, there is not a single profitable binary option robot. If you decide to sign up for Option Robot, you will need to deposit your money with one of their affiliated brokers. Even if you already have an account with one of these brokers, you still have to open a new account through their page. Why? This is because Option Robot make money through referral to these brokers. The moment you sign up and deposit money with these brokers through Option Robot, they receive a commission from the brokers. This is why they don’t allow you to use your existing accounts even if it’s from the same brokers. Because if you use your existing account, they can’t get their referral fees. For the brokers, they make money through your losses. Unlike stock brokers who receive their commissions in the form of trading fees, binary option brokers profit from your losses. There is a direct conflict of interest between the brokers and their clients. Since they don’t charge trading fees, they make money from the clients through their bets. Your loss is their gain. This is why Option Robot teams up with these affiliated brokers. Every time Option Robot makes an automated trade for the clients and lose it, they make a profit for their affiliated brokers. In return, these brokers give a commission whenever Option Robot refers a new victim to them. In the end, the clients become the sole losers, while Option Robot and their affiliated brokers make big bucks off the clients’ deposits. Yes, Option Robot is a scam. As I’ve said in the review earlier, I don’t recommend binary options trading as a way to make money online, at all. It’s basically the same as gambling, and using Martingale system only puts you in even greater risks. You are essentially putting your hopes and entire investment in an unfavorable gamble. You are far more likely to end up losing all your money than making any significant profit. Even if you have some cash to spare for entertainment, you’ll be better off spending it on a nice dinner with your loved ones. If you are determined to make money online, the best way is to learn how to build a real business and grow it slowly. Even so, there are too many scams out there that you have to be careful of. Read My Review of the Most Recommended Internet Business Opportunity Here.